How do hummingbirds survive the Texas summer? On a few of my recent hikes I have experienced a few fly byes from some resident hummingbirds. 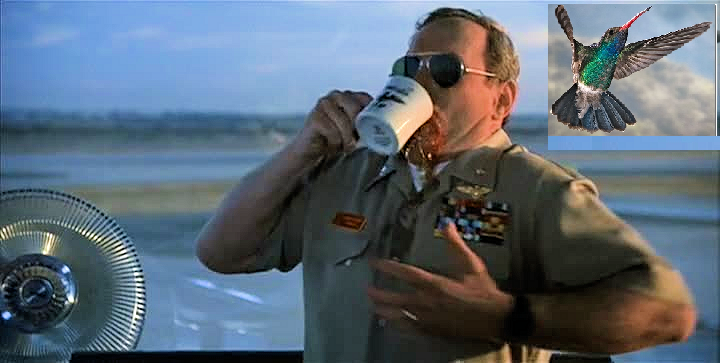 (cue Top Gun music and sunset scene) I decided to install a feeder on my patio and have been pleasantly surprised with the traffic. However, the more I think about it the more I become increasingly anxious for these little guys. What on earth are they doing here in the dry Texas summer? With no obvious flowering plants around, I can’t seem to figure out what they are eating in midsummer. Insert photo disclaimer-Since I am not a professional national geographic wildlife photographer with a $3000 camera I will be using photos that are available for use from open sources online. My photoshop skills are unmatched, hummingbird photo from naturespicsonline.com liscensed for open use. The most common hummingbirds you will probably see in Texas are the buff bellied hummingbird. The males sport a beautiful green collar and the females are characteristically brown and grey. This species is a native breeder but becomes less common in the winter as they head for fairer weather. 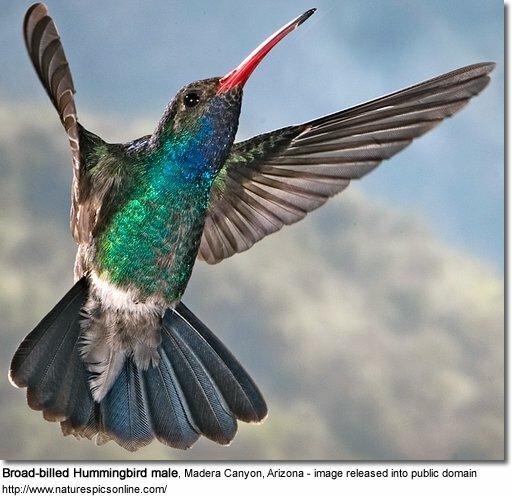 Another common visitor is a Mexican native that heads north, the Broad Billed hummingbird. The males are really beautiful and I have had at least one come visit my feeder so far. Hummingbirds migrate to or through Texas in spring and summer. They time their flight path to coincide with blooming of their favorite flowers. While most birders out there know that south Texas and the Texas gulf coast are hot spots for migration, you can see numerous species in central Texas all summer. Their migration is really a feat of endurance and biological evolution. A fully active hummingbird will have to feed every 10 minutes to sustain their metabolism. Surprisingly hummingbirds also eat tiny insects to gain fat and protein in their diet. What flowers are available to the hummers in June- July? According to an event hosted by TPWD, the Texas humming bird roundup, flowers in the genus Salvia top the list as the most popular food item. With numerous species to choose from, these plants are well adapted to the heat and will produce blooms at various times of the year. So if you are thinking to attract some more tiny winged visitors, throw up a feeder and plant your favorite Salvia. By the way how F****d up is it that TPWD doesn't give the author credit for writing their terrible hummingbird article? I mean it was really bad, maybe they didn't want to put their name on it.